Hypoglycemia (New Site) – Helping millions get off the blood sugar roller coaster. Why is hypoglycemia the elephant in the room? The Blind Men and the Elephant is an ancient parable that lays bare overreaching misinterpretations. The moral of the parable is that “experts” may lay claim to absolute truths based on their subjective experience while ignoring contradictory evidence. This fable holds so true when the subject of hypoglycemia comes forward either in a conversation or the written word. Most likely this occurs because there are many types of hypoglycemia and many causes, so advice often seems confusing and conflicting. What is certain is that hypoglycemia is one of the most perplexing, complicated, misunderstood, and misdiagnosed conditions of the 21st century. It’s not clearly understood by many in the medical profession, who often diagnose and treat patients by addressing symptomatic aspects of hypoglycemia versus the root causes. The Hypoglycemia Support Foundation has been a patient’s advocate for almost four decades. Because we were founded by a patient, we have a special understanding and approach that puts YOU at the center of the conversation. We also bring together the expert opinions of health care leaders who challenge the status quo and look to the source of metabolic disorders such as blood sugar dysregulation. We believe in the power of community and that powerful networks are essential to healthcare, healing and staying healthy. The Hypoglycemia Support Foundation provides support, advocacy and information about the causes, prevention and management of hypoglycemia, also known as low blood sugar. Below we answer a few of the most frequently asked questions about hypoglycemia. Our medical advisors are world renowned and we bring forty years of experience in helping patients find answers that are often challenging to find in conventional health care settings. If you spend a little time on this website, you will find many strategies and practical solutions that will help you reach your goal on your journey to optimal health. So, welcome and let’s get started on this healing journey together! An abnormally low level of sugar in the blood. In simple layman’s language, hypoglycemia is the body’s inability to properly handle the large amounts of sugar that the average American consumes today. It’s an overload of sugar, alcohol, caffeine, tobacco and stress. All carbohydrates (vegetables, fruits and grains, as well as simple table sugar) are broken down into simple sugars by the process of digestion. This sugar enters the blood stream as glucose and our level of blood sugar rises. The pancreas then secretes a hormone known as insulin into the blood in order to bring the glucose down to normal levels. In hypoglycemia, the pancreas sends out too much insulin and the blood sugar plummets below the level necessary to maintain well-being. Since all the cells of the body, especially the brain cells, use glucose for fuel, a blood glucose level that is too low starves the cells of needed fuel, causing both physical and emotional symptoms. What is reactive or functional hypoglycemia? Functional hypoglycemia refers to decreases in blood sugar that cannot be explained by any known pathology or disease. It’s a nice way of saying, “Your glucose regulating mechanisms aren’t functioning normally, and we don’t know why.” Reactive hypoglycemia refers to hypoglycemia resulting from the body’s abnormal response to rapid rises in blood glucose levels caused by diet or stress. The terms are now frequently interchangeable. Because all the cells in the body require glucose for energy, the symptoms of hypoglycemia are as varied as there are people who have the condition. Symptoms can be mental, such as depression, anxiety, confusion, insomnia, irritability, and even thoughts of suicide. Physical symptoms include fatigue, headaches, dizziness, fainting, convulsions, irregular heartbeat, sweating and cold hands or feet. Food addictions, food sensitivities or food cravings are also common in hypoglycemia. Feeling hungry, in spite of having recently eaten, is also a sign of hypoglycemia. What are the main causes of hypoglycemia? Medical conditions, such as tumors of the pancreas or adrenals, can cause hypoglycemia. Type I and II diabetes can result in hypoglycemia when insulin or other glucose-lowering medications are not followed by food intake. Gastric bypass surgery can result in post-prandial (after eating) hypoglycemia due to “dumping syndrome.” Functional or reactive hypoglycemia, which is the kind we are addressing here, is caused by poor diet, stress and lifestyle. A diet high in refined sugars and carbohydrates is a common theme among diagnosed hypoglycemics. Stress is another common cause of reactive hypoglycemia. Poor diet and stress usually go hand-in-hand. Persons who suffer from a lot of stress often reach for those high sugar, high starch comfort foods to help them deal with the stresses in their lives. This is a perfect breeding ground for the development of reactive hypoglycemia. People whose lifestyles give them little time for sleep, relaxation or play can easily develop reactive hypoglycemia. What are the best tests for hypoglycemia? The five-hour glucose tolerance test (GTT) remains the gold standard for diagnosing hypoglycemia. The patient fasts overnight and a baseline blood glucose level is drawn. A cocktail of glucose in water is then consumed. Blood glucose levels are drawn at 30 minutes, one hour, two hours, three hours, four hours, and five hours from the time of the glucose consumption. If the blood glucose falls below fasting levels at any time during the test, the patient is diagnosed with hypoglycemia. Another common response to the five-hour GTT is what we call a “flat curve.” Glucose levels do not fall below fasting but they do not rise in response to the glucose load that was consumed. This, too, is diagnostic of reactive hypoglycemia. There are many practitioners who consider the five-hour GTT too stressful for patients. Therefore, alternative methods of diagnosing reactive hypoglycemia have been used successfully. These include allowing the patient to eat a high carbohydrate breakfast as the glucose load prior to the five-hour GTT. Other practitioners consider a fasting glucose below normal to be suggestive of reactive hypoglycemia and treat the patient accordingly. Still other healthcare professionals, who suspect reactive hypoglycemia, place the patient on a high-protein, low carbohydrate diet. If the patient responds favorably, the clinical diagnosis is made. How do you treat low blood sugar symptoms? The best way to treat low blood sugar symptoms is to avoid a drop in blood sugar with the use of diet. However, if symptoms do occur, the best response is to eat a high-protein snack with a small amount of whole food carbohydrate. The small amount of whole food carbohydrate will help raise the blood sugar, but not too quickly. The protein will then help stabilize blood glucose levels without precipitating another drop. What is the relationship between low blood sugar (hypoglycemia) and high blood sugar (hyperglycemia)? Hypoglycemia and hyperglycemia are two sides of the same coin. They are commonly seen together, particularly if the hypoglycemia is long-standing. In reactive hypoglycemia the pancreas is producing too much insulin in response to a rise in blood glucose. Inevitably the pancreas will become fatigued, at which point it will fail to respond to blood glucose increases in a timely manner. Hyperglycemia is the result. When the pancreas finally does respond, it does so with too much insulin and a drop in blood sugar, i.e. hypoglycemia, occurs. Eventually, the patient can develop full-blown diabetes as the pancreas becomes more and more fatigued. What is the best diet for those who suffer from hypoglycemia? The best diet for hypoglycemia is one that is high in protein, moderately high in fat, and low in carbohydrates. Frequent feedings are often necessary to control long-standing functional hypoglycemia. The diet for hypoglycemia is designed to avoid a drop in glucose, NOT to fix it after it falls. Eating sugar in all its forms, as well as eating refined carbohydrates, triggers an excessive reaction by the pancreas. These foods must be avoided. There is a genetic tendency towards this condition, but much of what your pancreas is doing is caused by poor diet and lifestyle choices. How does hypoglycemia affect those with type 1 diabetes versus type 2 diabetes? In patients with type I diabetes, the pancreas can no longer secrete insulin. It must be supplied by insulin injections. Hypoglycemia in type 1 diabetics is the result of excess insulin injections or insulin injections taken without food. In type 2 diabetics, the pancreas has the ability to produce some insulin. However, it has been abused by poor dietary choices. Therefore, excess insulin production is seen as a desperate attempt by the pancreas to continue working. This, as well as too much glucose-lowering medication, can result in hypoglycemic episodes. A type 2 diabetic will need to follow the same high protein low carbohydrate diet as the reactive hypoglycemic. How do stress and lifestyle relate to hypoglycemia? Stress is a common cause of reactive hypoglycemia. Just as eating refined sugars and carbohydrates will rapidly raise blood glucose levels, stress can do so as well. The adrenal glands, which sit on top of each kidney, produce adrenaline and noradrenaline in response to stress. These hormones are designed to raise the blood sugar, raise the blood pressure, and ready the body to fight or flee. Chronic stress will, therefore, produce chronically high blood glucose levels. The pancreas will respond to this condition by chronically secreting insulin. The consequent hyperinsulinemia results in hypoglycemia. Too much work, lack of sleep, and chronic stressful relationships, can all result in hypoglycemia, even if the diet is adequate. What does hypoglycemia have to do with my mental health? The brain’s preferred fuel source is glucose. Hypoglycemia starves the brain of this much-needed fuel. When blood glucose is low, the brain will not function properly and all the symptoms of disturbed mental health can occur. We have heard the term psychosomatic, which means emotions can affect our physical health, positively or negatively. In hypoglycemia, our physical health (hypoglycemia) is negatively affecting our mental health. The term is “somatopsychic,” and it is just as real. Is hypoglycemia caused by one thing? There are certainly some things in our life, that if we cut out, or significantly reduced, might help control hypoglycemia… like sugar or processed carbohydrates. But, as we point out in our infographic, there are many different types of hypoglycemia and many different causes. One concept that might help to understand this is called the “exposome“. Here is a great article introducing the concept and why it is the “next big thing in your health.” You might consider getting a hold of a copy of the Do’s and Don’ts of Hypoglycemia or watching “Sweet Revenge: Turning the Tables on Processed Foods“. These educational resources don’t propose radical steps – just cutting out or reducing the worst offenders. A more advanced technology solution is offered by our partner “perfact“ – a platform that allows you to filter out the thousands of potentially harmful ingredients in our food (and beauty product) supply…based upon your own preferences. For more answers to commonly asked questions about hypoglycemia, please click here. Over the years, a number of books have been written on hypoglycemia. 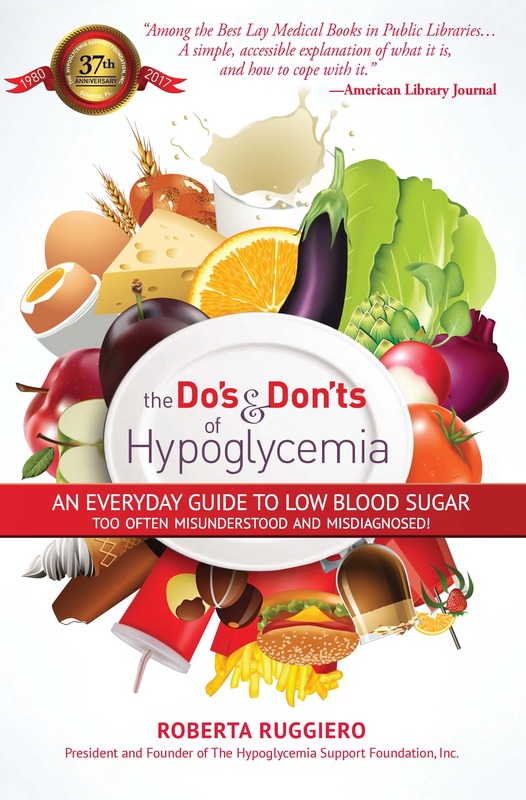 Only one has been reprinted in a 5th Edition—Hypoglycemia Do’s and Don’ts, written by Roberta Ruggiero, Founder of the Hypoglycemia Support Foundation. Click below to learn how to get your own copy of this book. Check out this detailed infographic about reactive / functional hypoglycemia!